Some 900 years ago an extraordinary occurrence took place on Market Day in the English midlands town of Coventry. Two monks at St. Albans Abbey in Hertfordshire first recorded this amazing story in Latin. 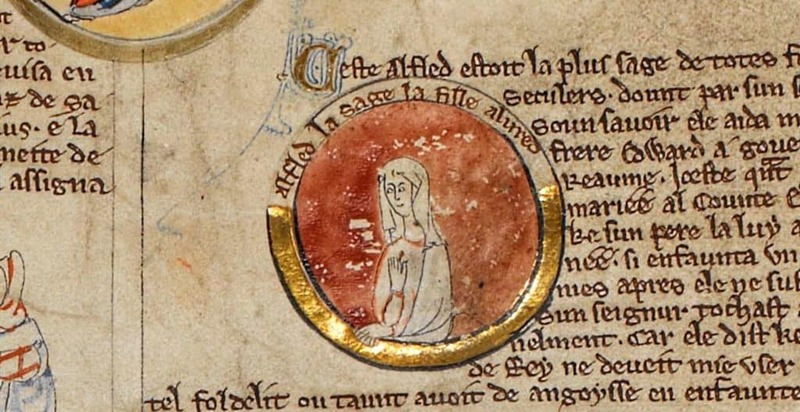 Roger of Wendover wrote of it in the twelfth century and Mathew Paris in the early thirteenth century. As the Abbey stood at an important road junction, it would seem that the monks may have heard the story from travellers who were on their way from the Midlands to London. The astonishing tale that has come down to us through the centuries, is that sometime in the eleventh-century a proud, pious lady rode through Coventry on Market Day completely naked, covered by nothing but her long hair! Was this true? Apparently so! Who was this pious medieval streaker? Lady Godiva was the lady, wife of Leofric, the Earl of Mercia. Earl Leofric was one of the all-powerful lords who ruled England under the Danish King Canute. Lady Godiva was a rich landowner in her own right and one of her most valuable properties was Coventry. Leofric was a tyrant, he tyrannised the Church and did not hold the same religious convictions as his wife, nor her fondness for the Midlands and its populace. He mercilessly demanded from the people of Coventry an oppressive tax called the Heregeld. This tax paid for King Canute’s bodyguard and Leofric made sure that the people of Coventry paid it! Lady Godiva pleaded with Leofric to stop this hated tax and he is reputed to have said, “You will have to ride naked through Coventry before I will change my ways”. He was quite sure that his demure, modest wife would never do such a thing. But Lady Godiva took him at his word, and on Market Day in Coventry she rode naked, veiled only by her long golden hair. As her hair was long enough to cover all her body, only her face and legs could be seen. Leofric was so stunned by the whole incident that he believed it was a miracle that no one had seen his wife’s naked body, and he immediately “freed” the town from paying the hated Heregeld, and at the same time ceased his persecution of the Church. Leofric appears to have undergone a religious conversion after this incident and he and Godiva funded a Benedictine monastery in Coventry where they were both buried. Unfortunately all traces of this monastery have long since disappeared. By the 17th century the story appears to have been altered slightly. The new version of the story said that before her ‘ride’, Godiva sent out messengers to go throughout the town insisting that all the people stay indoors with their windows shuttered on the day. As she was very popular with the people (unlike her husband) and every taxpayer realised that they stood to gain from her ‘heroic act’, they did as she requested. Everyone complied with her request except for one man who couldn’t resist peeping, a tailor, ‘Peeping Tom’. He was, the story goes, ‘blinded by the wrath of Heaven’ for his temerity in not obeying the order. A statue supposedly of Peeping Tom, a strange wooden effigy, can be seen in Coventry’s Cathedral Lanes Shopping Centre. The eyes in this effigy appear blank, but that may be because the paint has worn off over the years. The annual Coventry Fair kept alive the Godiva story until the Reformation when the festival was banned and it was not revived until 1678. From this time on Godiva rode through the streets on a snow-white horse, accompanied by a man whose chief skill lay in his ability to make rude, suggestive gestures. Peeping Tom again!! The Godiva Procession has been revived in recent years and takes place annually in June. Today a visitor needs only to look in front of Coventry’s Cathedral Lanes Shopping Centre to see a replica of the sight which tradition insists struck Peeping Tom blind!